A confluence of events delayed this Write Out post, and I’m sorry to have taken a hiatus just as the weather was improving enough to make Writing Out seem like a good idea. I made this trip to Café Rumba in January, and my goal was to visit somewhere local but unconventional. It’s my first Write Out in a venue that doesn’t register at least partly as a coffee shop, but you’ll see some writer-oriented aspects of the visit that make Café Rumba work. Café Rumba is, in part, the nexus of a cultural network. 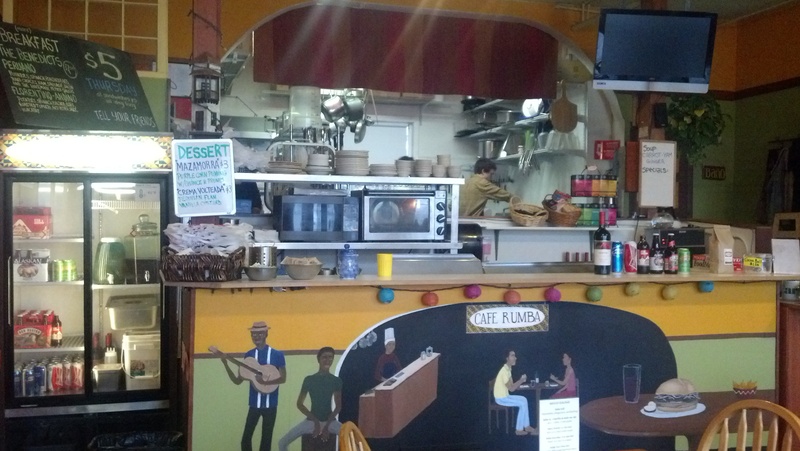 Apart from serving genuine Peruvian food, the Café promotes salsa dancing via Rumba Northwest. But you’re here to write, holed up in a corner, not dance, so let’s get on with it. The restaurant is light and airy, with brightly colored walls and cheerful graphics. As a mood-enhancer, the room will do you better than, say, some of the substances that élite writers have used over the centuries to keep them at their creative task. And yet, if you want to kick back with a celebratory beer or some wine, Café Rumba can accommodate you, and they stock Peruvian beer. The staff at Café Rumba are welcoming and attentive; they encouraged me to try tastes of some of their more exotic items. I encourage you to ask for the same. If you’re looking for a late-night Write Out, this won’t be your spot, but if you want to get some breakfast while you work, you’re set. The advantage to Writing Out at a restaurant (for me, at least) is that a caffeinated drink cranks my metabolism and sends me in search of protein, and at Café Rumba, I can eat a sandwich at lunch and get back to work. 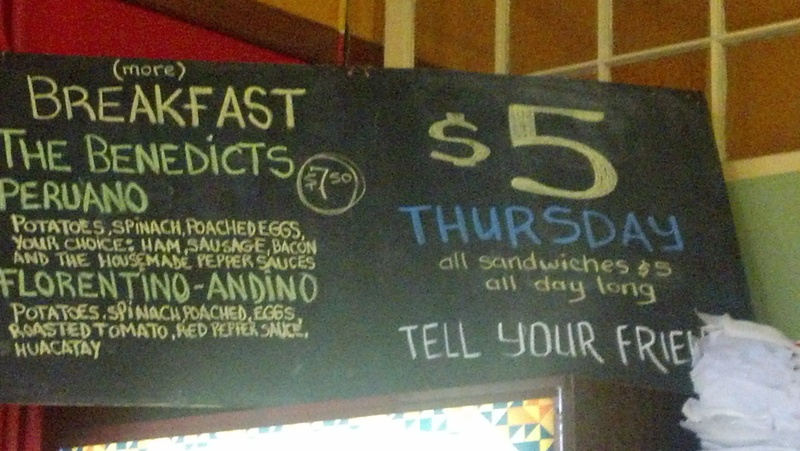 Thursday is an especially good day to order a sandwich, as they all are on special for $5. My blog isn’t about the quality of a venue’s food, but I do want to note that the food here is distinctive. One of the charming aspects of Bellingham (for me) is the variety of ethnic foods available. After I became acquainted with Peruvian food, I was delighted to find that we have it available here. We need to ensure that such treasures stick around. Keep Café Rumba in mind when you’re looking for a place to Write Out, or for something as mundane as eating intriguing food. 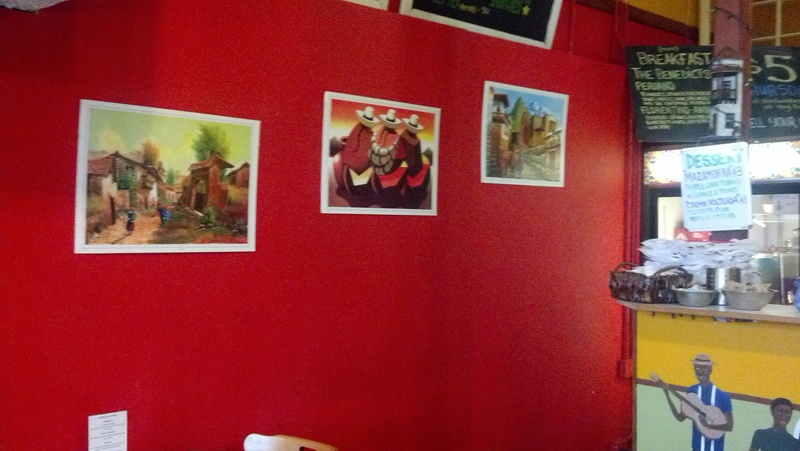 An architectural feature of Café Rumba is a little niche with a table (see photo below). Sitting there to write made me feel as if I were working in a garret, creating some Romantic work by candlelight. I felt cozy and productive. And what have I accomplished in the time I spent not blogging, between my Writing In and my Writing Out? More than I realized. I did extensive work on a Spanish-to-English academic translation, which ate up some of the time. I also recorded my novel thing (eight hours of audio, after editing), and I’ve begun to compare the audio to the manuscript to get all of the stuff I dislike fixed up. When it’s done, I’m sending it to a contest you can also enter, run by the Whidbey Writers Workshop. Apart from my writing, I got through the end of another quarter, and past a virus that had me dragging for all of the last two weeks of said quarter. I am also ready to announce that the next Dwyer Café/Red Wheelbarrow Writers Write Out Field Trip has been set for April 20. Details will be coming in a few days, but save the date now. I already have one taker, and we’ll be limiting the group to twelve. If you comment here requesting space, you’re in. I got my first rejection of the year in mid-March. After last week’s talk by Wendy Call about the value of rejection at the Whatcom Writers and Publishers monthly event, I’m looking forward to getting more stuff booted back at me. An occasional acceptance is welcome, however. Count me in for the field trip! 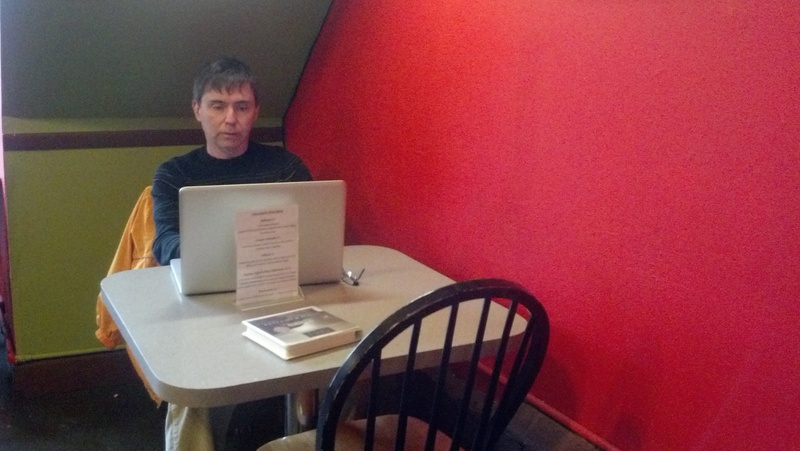 Inspiring write-up on your write out at Café Rumba. Count me in for the 20th, too. Such fun the last time! Count me in. I may have to cancel, but I’ll know long before then. I’ve enjoyed Cafe Rumba a couple of times, but would not have thought to write there… so I’m glad you shared this with us!